The United States Congress designated the Manzano Mountain Wilderness (map) in 1978 and it now has a total of 36,763 acres. All of this wilderness is located in New Mexico and is managed by the Forest Service. Don't let this area deceive you. It looks devoid of scenery from a distance, but is full of surprises as you explore the trails. The same held true in the early 1700s, when explorers visiting a small village on the eastern edge of these mountains discovered very old manzanos (apple trees), a fruit tree not native to this country. The name Manzano was given to the area due to the discovery of the old apple trees. Spread out across the western slope of the Manzano Mountain Range, this Wilderness varies in elevation from about 6,000 feet to 10,098 feet atop Manzano Peak. Pinion and juniper grow low, gradually submitting to ponderosa pine and then spruce, fir, and aspen higher up. This is steep and rugged terrain for the most part, cut with canyons and marked with outcroppings of rock. Thousands of raptors migrate along the Manzanos in spring and fall as they work their way between Canada and Mexico. More than 64 miles of a well-developed trail system provide access to the Wilderness, although the lack of reliable water sources and campsites may explain why so few people take advantage. One hike starts at Fourth of July Campground near the eastern boundary and leads 1.5 miles to the crest of the area. From there, a trail runs along the crest for 22 miles to Manzano Peak. 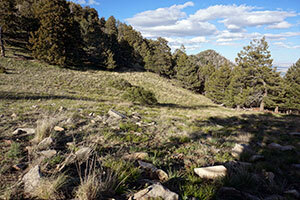 Planning to Visit the Manzano Mountain Wilderness? How to follow the seven standard Leave No Trace principles differs in different parts of the country (desert vs. Rocky Mountains). Click on any of the principles listed below to learn more about how they apply in the Manzano Mountain Wilderness.